Tomatillo is also known as Toma Verde or Ground Cherries. It is a member of the nightshade family, related to tomatoes. It is grown like a tomato, and the plant and leaves look like a tomato plant. That is where the similarity ends. Twenty years ago, most Americans did not even know of Tomatillos, let alone think about growing them. Now, avid gardeners looking for something different to grow, often turn to Tomatillos. The fruit of the Tomatillo is green, and about the size of a large cherry tomato. The inside is white and meatier than a tomato. Tomatillos grow inside of a thin paper-like husk. They are used in Salsa, jams and other mexican recipes. Green Tomatillos are most commonly found in the U.S. There are also purple and yellow varieties. Sow seeds indoors six to eight weeks before the last frost. Transplant tomatillos into your garden after all chance of frost has past. Plant seedlings 18 - 24 inches apart, in rows three to four feet apart. Tip: Harden off your tomatillos by bringing them outdoors for increasing amounts of time, beginning a week before transplanting. Make sure to bring them in, or put them in a cold frame, if frost is forecast. Tomatillos like hot weather. They are grown just like tomatoes. Provide plenty of water, and mulch around the plant to retain water. Feed them regularly, and switch over from nitrogen to higher phosphorous and potassium as the plants grow, to promote flowering and fruit set. Insect infestations are fairly uncommon. Occasional chewing and sucking pests will affect them. The most common pests are cutworms, snails and slugs. Tip: Stake your plants up to keep the fruit off the ground. This keeps the snails and slugs away and damage from lying on the ground. A number of plant problems can arise, usually in mid summer heat and humidity. Blights and fungus infections can occur in the high humidity. Early treatment with fungicides is effective. Spacing plants too close, cuts down air circulation and promotes disease. Tomatillos are ripe when the paper-like husk turns brown and breaks open. Remove the husk, and rinse the oily substance off. Store in a cool, dry place until you are ready to use them. Tomatillos are a tender annual. Transplant them in your garden after all danger of frost has past. Cover tender seedlings if frost is forecast. If there is fruit still on the plant in the fall, cover them with a sheet of plastic, a blanket, or an old tablecloth. They will succumb to any frost. Thanks Mischka for the valuable information about Tomatillos. This is my first year growing them. I remember as a child, Tomatillo plants in my grandmother's backyard. What varieties are people growing? This year, I am growing Merida Market Tomatillo. Here is the description from Sandhill Preservation. "Smaller fruits, but a nice purple color. More dependable yielder than Purple. For some reason the husk worms bother these less". Has anyone tried growing tomatillos in containers? Any suggestion for containers size? How many plants should I grow? It is just my husband and I. I know many people that always grow an extra plant to freeze the tomatillo fruits. My grandmother, usually boils the tomatillos, purees them (once cooled) and puts them in freezer bags. I find them very easy to start; they grow quickly, are easy to transplant and grow into very healthy plants quickly that bloom at a very small size. What i find to be the mystery is in getting them to fruit! I grew Cisneros a few years ago - huge plant, no fruit at all. Purple tomatillo has been a bit luckier for me. Does anyone know if you need to plant two types to get cross pollination for fruit set? The related Husk Tomato (like Cossack Pineapple) is much more prolific, absolutely delicious (an unusual sweet tropical fruit flavor) - and thrives in a pot! One thing to keep in mind - tomatillos are sprawlers, and are best either allowed to sprawl and cover a large area, or cage (from the start!). The branches are not pliable and break easily, so staking does not work. The shorter sweet Husk Tomato doesn't need staking, and grows into a nice compact bush in a pot. How do you use it? Is it a salsa ingredient like tomatillo? Or is it more of a berry. The words: fruity, compact, pot, made my ears ★★★★★-up. I have made salsa, sauces and chutneys with these guys. They are a nice change from straight tomato. I have actually not used them with tomato, but, on their own as a substitute for the mater and they work well in that capacity. I think they count as fruit, not berries. Cossack Pineapple (the husk tomato) is incredibly delicious - I brought some to Tomatopalooza and people really liked them. They really should be used like a fruit (dessert), though they could actually work well to add a fruit tone to a savory salsa. You can see a few green fruit. When ripe, they tend to drop off the plant - husk turns brown, small round 1/2 inch to 3/4 inch diameter fruit are a pale yellow orange. I wonder if you use to call a tomatillo any kind of Physalis? We used to call them as in Latin - Physalis. Other question is about days to maturity. Seems to me we have very early varieties here in CIS, because most of them get mature in 90-120 days after germination (60-85 days after transplanting). And it was mentioned here than normal varieties ready to ripe in 90-100 days (after translanting I assume). Can they be grown in the same kind of cages used for tomatoes? All my cages are made from concrete remesh wire. I have been wanting to grow some of these for salsa. 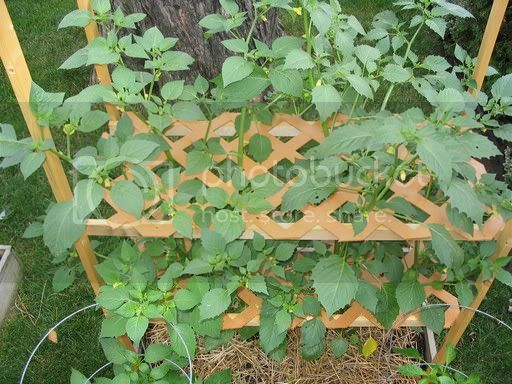 Raise my very large Cisineros Tomatillo plants in remesh wire cages which lend adequate support to these sprawlers and obtain a huge yield per plant. "A salsa Lovers Friend"
I grew my 1st last year and loved it, someone sent me seeds out of the blue, tomatillo hybrid I believe it was called. Tasted like a green apple. I heard they got big and sprawled like mad, which was what I was looking for, I had this idea in my head I wanted to try for a big sprawler. It is based on the Japanese Sprawl method...only with more layers. I am continuing to look for information relating the effects of cross pollination with other cultivars to production quantities. I found there was a fair amount of looseness with names among these plants and decided to grow out several to compare--some called tomatillos were actually husk cherries, etc., etc. I'm not a big fan of earwigs either, in fact, they are the bane of my existence in the Spring and it's all I can do to beat them out of the ground by using cloches and other covers for tender seedlings so they don't destroy them before they even have a chance to get going. Thankfully, I've not seen them on my tomatillos so far. They look like very small dinosaurs to me. The husk tomato you see in the pic. is a ground cherry. Same family, sweeter than the tomatillo--ground cherry jam is also delicious!